Cool Finds, reptile show dart frogs! Hey all, I went to a local reptile show a little while back and “interned” at a friend’s table (Check out Jurassic Pet Supplies, the only shop I have been to that can rightly be called an “invertebrate store”, they have hundreds of tarantulas at any one time, dozens of scorpions, true spiders, including trapdoors when they can find them, millipedes, centipedes, isopods, beetles, and whatever else they can get their hands on! And they ship!). Right next to him was his friend at Tim’s Dart Frogs, who had quite a variety of Dart Frogs and live plants. Very cool! Dendrobates tinctorius morph, I think. Dendrobates leucomelas, Bumblebee (I have one of these). D. tinctorius “Alumnis”? Something “Giant”? They are definitely beautiful. Another D. tinctorius morph, I believe. Tadpoles, these were only $10, which is a pretty good deal if you are willing to take care of them till the metamorphose. Phyllobates terribilis, I think up top, D. tinctorius “Azureus” on bottom. Anyway, check out https://jurassicpetsupplies.com/ for some great deals and finds, I have bought from them for over a year now, and I trust them completely. Right now they have some Potato Bugs, or Jerusalem Crickets (Red Form) in stock. The red is absolutely incredible, you have to see it to believe it, and I have never even seen or heard of these from anywhere else. Unfortunately, every time I opened the lid to get a picture, the lumbering cricket charged to where the opening is, leaving me with blurry pictures through the plastic that were not worth posting. As the name above suggests, I will be doing a series of posts of cool creatures I have found recently, some which I have collected, others that I have left be. Identified to the best of my ability. Blue Death Feigning Beetles (Asbolus verrucosus). There was three of them underneath a well insulated board, but one crawled into a hole before I could get a picture. It had just rained, and the moisture level underneath the board was high. Larvae, which are probably beetle larvae. They were found under a moist, well insulated rug that had been left in the desert. Unidentified Darkling Beetles (At least I think so). Dialbolical Ironclad Beetle (Phloeodes diabolicus), I think. It tucked its legs in so completely when disturbed it looked like a an empty hull. Very cool! Thats it for this post! See you next time! Hello Everyone, sorry about the long diapause (pun intended) on posts, I have not been able to keep up with everything else and the blog. But I am back for now, with some pretty cool new stuff and some things found while collecting! First up, my tarantula collection is doing really well, My GBB is getting to a decent size! Notice my thumb in the background (around 3-4 inches both ways). My Tapinauchenius violeaceus is much larger now since the last picture, I rehoused him into a larger jar. Tapinauchenius sp. “Colombia”. When it was younger it had beautiful yellow spots on it’s abdomen, then it went brown, and now it’s a pretty reddish-brown with blonde-brown highlights on the legs (I am color blind, so that is what it looks like to me). Definitely a good deal for only $10! I would highly suggest getting Tapinauchenius species as a beginner arboreal tarantula. Much more robust than Avicularia’s, calmer than Psalmopeus’s, and definitely better than Poecilthoria’s. Both Tapinauchenius sp. I posess. Much more to come in future posts! I am going to try and do smaller posts regularly, instead of large posts irregularly. So, see you next time! Hello Everyone! I have had quite a bit happen in my collection over the past couple months, including new stuff! Anyway, lets jump right in. I finally got some good pictures of my Tapinauchenius sp. “Colombia”. Turns out he was molting, so thats why I didn’t see him for a while. The yellow on his abdomen is much brighter in real life. 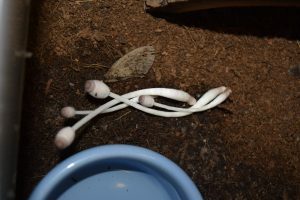 Some weird fungi has grown in some of my enclosures, such as the long, elongate mushrooms I found in my Grammostola porteri’s enclosure. (sorry about the blurriness, I am having trouble with the aperture on the camera). Moving on, I have found quite a few cool invertebrates around my neighborhood. Here is a picture of some sort of fly….. Some species of shield bug (I think)…. A large moth that was hanging out around our porch light…. And this cool Praying Mantis that I found at my Grand Parents house…. And now for the new stuff! I just got six Centruroides hentzi as an early birthday present, of which one was dead when I got it, I just didn’t notice it, and another which had two scorplings but died after a few days in my care (sadly, the scorplings died a little later too), and another which died after about two weeks for almost no reason I can think of. Anyway, the other three look O.K., thank God. They are in a gallon jar in a communal setup. I am getting another C. hentzi as a refund since the one was dead when I got it, and I am going to buy another since the mother one died as well. Anyway, I hope I can get a breeding colony going soon. Pictures coming soon! I also purchased a Huntsmans spider, a Heteropoda insubtilis (or is it Holoconia insubtilis? Who knows?)! At roughly an inch in legspan fully stretched out, he is still rather small, but boy, is he fast! I dropped a pinhead cricket in, and I couldn’t tell if he nailed it before or after it hit the ground. Crazy fast. My grandfather also got himself a Scolopendra subsinipes subsinipes, or Giant Vietnamese Centipede. I am taking care of it for him, so that’s cool. He is in his new jar, so I’ll try and get some pictures of him there soon. I have a few other new animals to share with you at the next update, so until then, see ya! Hey Everyone, I have bad news. For some reason one of my Chicobolus spinigerus died a few days ago, and a few weeks back I found one of my Ebonies dead as well. They were both found dead on the outer edges of the terrarium, so I think they might have fallen from the lid to the substrate. There might be some other reason though, so any insight is greatly appreciated. I have a ton of babies, so its not a terrible loss, but it still is sad. Anyway, on a higher note, I’m looking at getting some new scorpions and maybe some assassin bugs, so stay tuned! Hello Everyone! I have got some new stuff and new pictures over the week! I’ll start off with the tarantulas. I got some new pictures of my Grammostola pulchripes, Brachypelma albopilosum, and Brachypelma emilia. Here’s some pictures of the freshly molted Grammostola pulchripes…. I always have trouble getting him to eat, it seems like he/she eats four of five crickets, stops eating and waits a month, then molts. Frustrating. Brachypelma albopilosum dancing to the tune of cricket cries for mercy…. Brachypelma emilia sling starting to look like the adult a little. He’s/she’s starting to eat again, so thats a relief. The first thing thats new is a Brazilian Red Head Tarantula, Bumba cabocla, thats around 1/4 of an inch. I’ve been wanting one of these for a little while now, so I was pretty happy when this one didn’t sell for a little while and I was able to get it. I got him from a friend who owns a Reptile/Invertebrate store (seriously, he has more invertebrates than reptiles). Now, I got some pictures of my brothers corn snake, which is a Hypo Het morph. This guy got out once and terrorized my family, before we found him in a hallway, two days later, slipping and sliding around on the smooth floor. Anyway, here he is…. I got some better pictures of my millipedes as well. 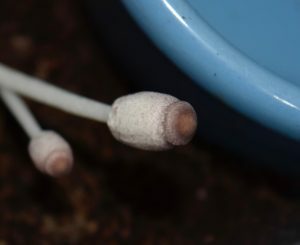 My pedelings are doing really well, with some around 1/3 of an inch now. The largest pedeling and two of the Bumblebees below. I snapped some pictures of my Desert Chocolates (Orthoporus sp.) in their new enclosure. They put a sizable dent in the rotting log I put in their cage. I measured the largest one and it was about 5.5 inches long. Wow! In the future I would like to get some Desert Golds (Orthoporus ornatus, “Gold”) to go with them. And the Oxidus gracillis, or Greenhouse millipedes, with a small plant growing in their enclosure. And now for my newest addition, 10-12 Therea petiveriana! (More commonly called White Spot Domino Roaches). I have been wanting to get roaches from the genus Therea for a little while now, so it was really a blessing when my friend got some Domino roaches in for his shop. He got these from Bugs in Cyberspace, and had been originally wanting to start a culture, but changed his mind after he ordered them and sold them to me. I bought them for Bugs in Cyberspace starter cultures going price, and didn’t even have to pay shipping! What a Blessing! I plan on breeding these once they mature, so hopefully I’ll be able to raise them successfully. Here is one of the larger nymphs, all the others are hiding or underground. Can’t wait till they mature! Thats all for now! See you next post! 1. Glorify Jesus Christ our creator. 2. Spread his love, life and light. 3. Expand the hobby of keeping arthropods of all kinds. 4. Connect the world of invertebrate keepers. 5. Share my collection and experience. 6. And finally, help out other hobbyists in any way I can. 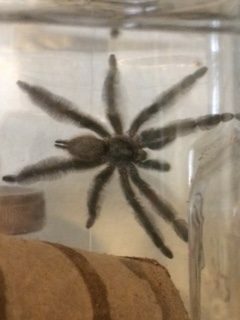 Grammostola porteri, Chilean Rose Hair, around four inches. This guy has escaped twice, once taking a tour of my entire room. That is a moth wing you see in the pictures, I fed him a large moth that he promptly took down and ate. Tapinauchenius violeaceus, Purple Tree Spider, 1.5 inches. I love the genus Tapinauchenius, their so pretty, and their good eaters too. I also have a Caribbean Tree Spider (Tapinauchenius sp. ), but he’s burrowed down into the substrate. He’s really beautiful though, I’ll try and get a picture when I can. Mexican Red Leg, Brachypelma emilia, freshly molted. 3/4 of an inch. This guy is a finicky eater. Curly Hair, Brachypelma albopilosum. Around two inches. Man, do these like to dig! Chaco Golden Knee, Grammostola pulchripes, molting and post molt. This guy is skittish, and once bit a hair brush I was using to check his temperament! Not what I was expecting from a Chaco Golden Knee. The molt in a defensive pose protecting the tarantula! Ha Ha. Green Bottle Blue, Chromatapelma cyaneopuebescens. Two inches. This guy likes to kick bristles. So beautiful! Tiger Centipedes, Scolopendra polymorpha. 4.5 inches. This first guy is vicious with prey, and likes to scare me by trying to jump out when I open the lid! The second one is about half the size of the first one. I caught him in Arizona, and plan on trading him with a friend for something else. Common Garden Centipede, Lithobius forficatus. 1.5 inches. This little bugger I caught in Sacramento underneath a palm tree head, boy, when they are disturbed they can really go fast! African Long Tail Centipede, Rhysida longipes. 3.5 inches. Sorry about the terrible picture, I’ll try and get a better one soon. He likes to dig down as soon as I open the container. Incredible elenogate terminal legs. 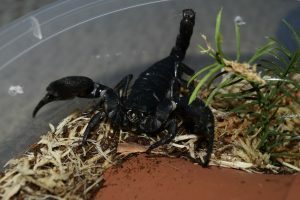 I “supposedly” have a Pandinius imperator, Emperor Scorpion, that has dug down into the Eco-Earth in its cage. I got him soon after this species was placed on C.I.T.E.S. I was told it was bred by the brother of the owner. He is very docile and I am pretty sure he is an emperor. I’ll work on getting pictures soon. 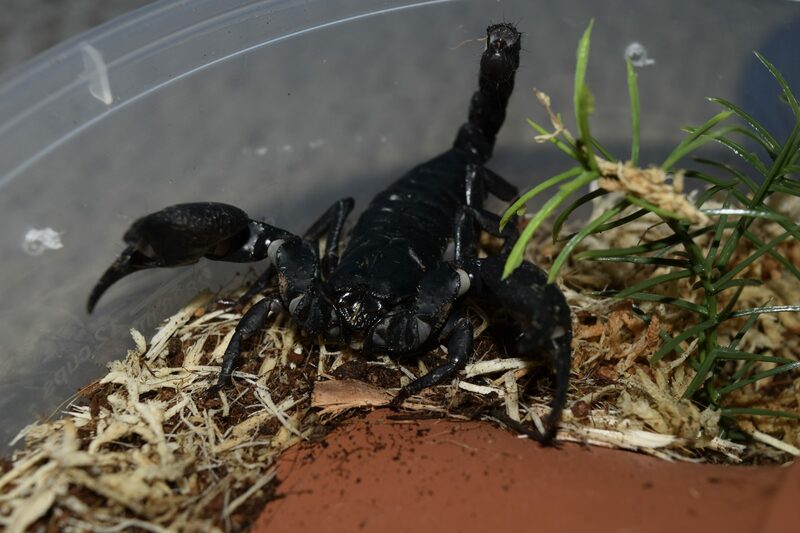 Asian Forest Scorpions, Hetereometrus cyaneus, 3-4 inches. I had three of these in the bin you see in the picture below as a temporary enclosure until I could get them into a larger terrarium, then one was cannabalized, and then a couple of weeks later, the one that cannabalized the other was trying to kill the second one. I heard the noises coming from inside the cage and was able to rescue the second one and move it to another cage. The first scorpion you see is the one that tried to eat the other scorpion. Here’s the one I rescued from the hungry scorpion. Arizona Stripe Tailed Scorpion, Paravaejovis spinigerus (formerly Hoffmanius spinigerus). One inch. I have three of these, and are they defensive! I have six Oxidus Gracillis that I caught in my backyard, but I don’t have any pictures of them at the moment. Scarlets, (Trigoniulus corralinius), Bumblebees, (Anadenobolus monillicornis) and Ivories, (Chicobolus spinigerus), plus Ebony morph. Various sizes and numbers including immatures. I have these all in the same two-and-a-half gallon aquarium with a glass lid. Right now there are baby millipedes overflowing out of the terrarium, so I plan on selling them when they get bigger. Below is the full enclosure. All the little white things are pedelings. I’ll get more pictures when I have a chance. Below is an Ebony morph and two Scarlets mating (only one can be seen in the picture). Various immatures of several instars. Smoky Oaks, Narceus gordanus. Around four inches long, plus some early instar babies. This species sure likes to stay underground a lot! It took me a little while to get used to that. I really like the thickness of this species. The last picture is of one of the pedelings. New Mexico Desert Chocolate millipedes, Orthoporus sp. “Chocolate”. 4 to 5 inches. I have two of these beautiful millipedes, which came from Belen, New Mexico. Sorry about the picture, that was when they were in their temporary enclosure. I’ll get some better pictures soon. Philliphine Blue, Acladocricus sp., 1-1.5 inches. I got these cool millipedes from Orin McMonigle. I can’t wait until they grow to adulthood, with that spectacular blue of theirs. I just put some more substrate into their enclosure, so the photo of the enclosure isn’t completely accurate. The larger in the pictures is the male, the smaller the female. Now for Reptiles and Amphibians! We have an American Toad that I’ll get pictures of when I have a chance. My brother also has a Corn Snake that we’ll get some pictures of soon. Bumblebee Dart Frogs, Dendrobates leucomelas. One inch. My brother and me share these beautiful frogs that we keep in a planted vivarium. The plants are a Lemon plant and a Pachira tree. We used to have a Turquoise and Black Dart Frog, but it died because of a mold outbreak. We love these frogs! The Lemon plant is the closer one, the Pachira the farther one. Rosy Boa, Lichanura trivirgata. Three-and-a-half feet. Male. This is the only reptile that I have personally (I’ll try and fix that soon, ha ha) and he sure is beautiful. I like how docile these are and their ease of care. Well, that just about wraps it up. Hope you enjoy my blog! Till next time…..
AlexW on Cool finds, Beetles.